Grandeur of rulers, glory of its past, glimpse of their enigmatic way of living, are still alive in the form of palaces like Chowmahalla Palace, a place worth visiting when on a Hyderabad tour. Built in the 18th century, almost 200 years ago, the Chowmahalla Palace is one of the popular sightseeing places in Hyderabad. The literal meaning of this place is “Four Palaces” with “Chow” means four in Urdu and “Mahalat” which is the plural of “Mahalel” meaning palaces. Chowmahalla palace is said to resemble Shah Palace of Tehran in Iran. 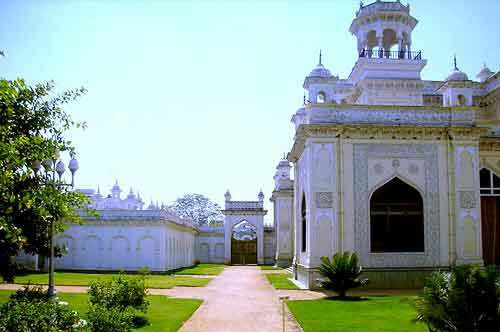 The construction of Chowmahalla Palace was mainly completed between 1857 to 1869 during the rule of fifth Nizam, Afzar-ud-Daulah, Asaf Jav V. However, its building is mostly credited to Nizam Salabat Jang in 1790. The Palace originally covered 45 acres which extended from the Laad Bazaar on the north to the Aspan Chowk Road on the south. Now, the total remained area of the palace is close to 12 acres. The palace was restored by the Government and was opened to the public in the year of 2005. One can visit the palace throughout the week except on Friday and national holidays. The Chowmahalla Palace is consisted of two courtyards which are divided into the northern courtyard and the southern courtyard. The southern courtyard of the palace has four palaces which are namely Afzal Mahal, Tahniyat Mahal, Mahtab Mahal, and Aftab Mahal. The Aftab Mahal is a two storied building and is the biggest of all the four. The northern courtyard which has been open to public, houses Bara Imam, a long corridor with many rooms on the eastern side, which was once the administrative wing. Another captivating feature of this courtyard is the Shishe-Alat. This was used to receive guests and public figures. The Chowmahalla Palace has Clock Tower, Council Hall and Roshan Bungalow inside it. The Roshan Bungalow has been named after Roshan Begum who was the mother of sixth Nizam. Khilwat Clock, which is famous for ticking since the construction of the palace, can be seen inside the Clock Tower. 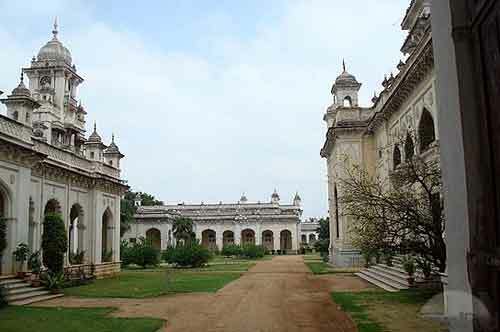 At the Council Hall, various manuscripts and rare books which were personal collections of the Nizam have been kept. The heart of the palace is called as Khilwat Mubarak. This grand Durbar hall is undeniably the best part of the palace. Mughal domes, imposing arches and an intricate Persian work create a masterpiece. Inside the Durbar Hall, there is platform made up of marble. It is on this platform where the royal seat, Takht-e-Nishan was laid. 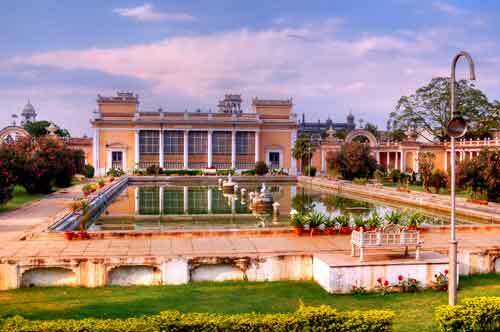 It is said that Chowmahalla Palace used to have around 7000 attendants on any given day. For its grandeur and charm, it has been often compared to the Enchanted Gardens of the Arabian Nights for its grandeur. Beautiful spread of lawn, its green landscape contrasting the yellow and white motifs of the palace presents a hypnotic sight. A huge water fountain in front of the palace, with artistically carved pillars is the first thing to offer a peek into the architectural excellence of this Chowmahalla palace. Intricate carvings on the walls and ceilings of the palace are also worth noticing. Glass chandeliers with different designs in each Mahal are also not to be missed. Various galleries in the Palace with each presenting an interesting display of crockery, clothes, furniture, coins and currency notes, pictures from the Nizam era, etc. are sure to keep you engaged. Display of weapons has been especially done in an interesting manner; these are displayed not just inside glass cabinet but on the walls as well, reaching till the top. Quran section showcasing Qurans of various kinds such as hand written Quran which has been restored by using Japanese technique, Naskh script, miniature Qurans printed in metal, some which have been inscribed in gold and many others. Vintage car and Buggee display is another major attraction of Chowmahalla Palace. A fish motif on a poll, which was gifted by Mughals, is also going to catch your attention. 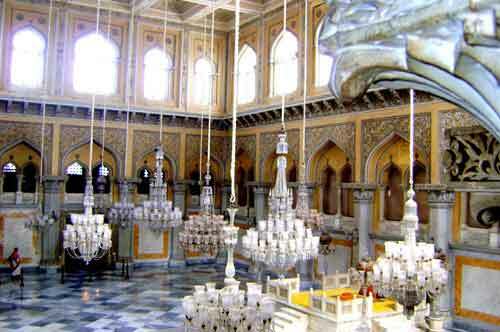 Another part of the Chowmahalla Palace that draws one’s attention is the Afzal Mahal. Entry to this part of the palace is not allowed. 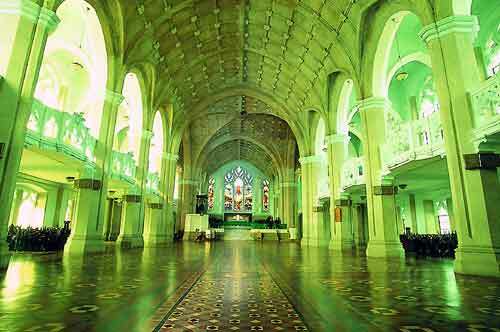 However, there are glass windows and a door through which visitors can see it inside. The hall of the palace which has been maintained as it is, shows us luxuriousness of Nizams lifestyle. Exploring at Ease- All over the Palace’s complex many benches with shade of trees have been built for visitors to relax. There is a canteen as well, which offers basic snacks and drinks within the palace compound. Hence, you can admire the architectural excellence of Chowmahalla palace and explore its various galleries without exhausting yourself. Photography and Photo-walks- With its intricate carvings, impressive structure and well laid-out gardens, this palace is nothing less than a heaven for photographers. Shopping- The souvenir shop at the palace is ideal for shopping lovers. It presents a wide range of collection comprising of carved decorative items, colourful showpieces with traditional designs and jewellery ranging from bangles, pearl necklaces to earrings, etc. The price range of these items is slightly high yet the collection and exquisiteness of them will allure to buy more than just one. For instance, a small carved metal elephant will cost you around Rs.500 while carved brass plates or camels are priced around Rs.1000 and above. 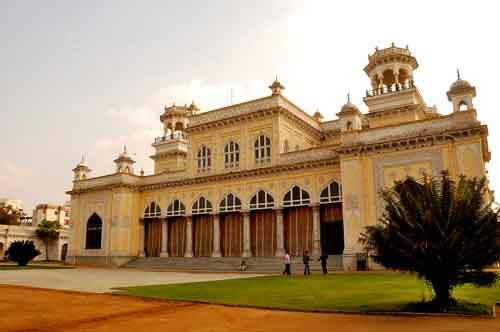 Chowmahalla Palace timings are from 10 AM to 5 PM. It is open on all days of the week except on Friday. It is also closed on national holidays. 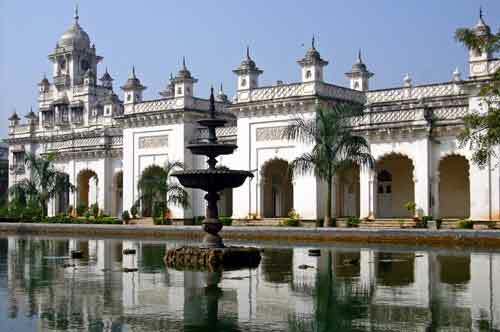 Chowmahalla palace entry fee is only Rs.80 per person for Indian visitors while it is Rs. 200 for foreign tourists. Hence you can plan your visit to this majestic palace without shelling out a lot of money. 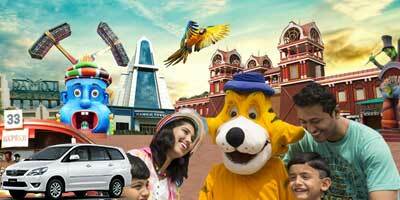 Photography and videography are also allowed in the palace with an extra charge of Rs.50 and Rs.200 respectively. However, in the Quran section of the Palace, photography or videography is not allowed. Chowmahalla Palace is one among the few historical buildings in the country that are well maintained and presents a clean complex. There are many galleries in the palace presenting an in-depth insight into the personal and political life of Nizams of Hyderabad. The displays are well organised and clearly marked, leaving no room for confusion. Picture galleries have detailed descriptions for each of the image displayed. The palace is an ideal place for history buffs and photographers. 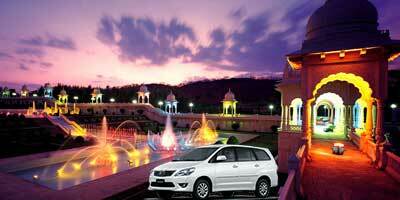 Ample of facilities have been provided within the Chowmahalla Palace complex. Inside the main gate of the palace, a vast spread of open area is available for vehicle parking. Clean restrooms, small yet sufficient canteen, strategically laid out benches and clean compound with dustbins throughout the compound make a tour to this palace even more enjoyable. However, there are a few sections of the palace that can be improved further. For instance, minimal or no description have been provided for many of the displays that can be seen outside the palace building. For instance, there is no information on the carved cannons which are kept in front of the palace and on the intricate carvings that differ on each of the cannon. The water fountain built in front of the place, amid the lush green garden, can also be cleaned to make it look even more captivating. Reaching Chowmahalla Palace is not a difficult task. 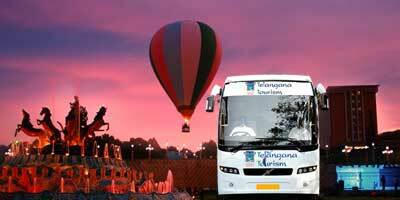 It is quite close to another popular tourist attraction of Hyderabad – Charminar. For those travelling by public transports, the Nampally/Hyderabad MMTS station is located nearby. From the station one can hire an auto rickshaw to the palace. There are also many buses running to and fro Nampally at regular intervals. 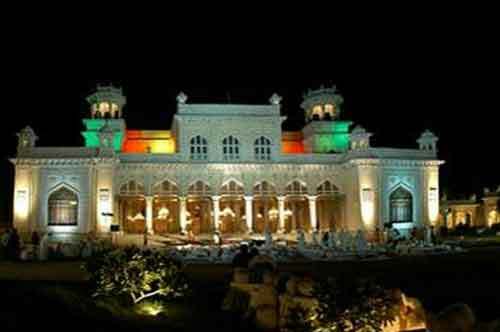 If you compare it with other big palaces, Chowmahalla Palace Hyderabad is not as big as other major palaces in the country. (I have seen some others too!) But I still loved this palace. It has good collection, especially the crockery they have showcased! Although before going do check the timings. I had gone at 4 so has very less time to explore actually. Chowmahalla Palace timings are from 10 in morning to 5 in evening. I have visited Chowmahalla Palace many a times. The best part of this palace is the Durbar; you will see a beautiful marble platform inside this hall. This palace has good collection too...all that you can see in the Council Hall. Do check Chowmahalla palace Hyderabad timings before going, like it's closed on Fridays and open every day other in the week..so remember that before planning. The best part of my visit at Chowmahalla Palace is the royal photograph. Near the exit, there is an option of that. You can dress in royal way and they will take a picture of you! Good experience, to just get a royal feel, for few seconds! Our visit to this palace was quite cheap as the chowmahalla palace tickets cost only 40 Rs. per person! 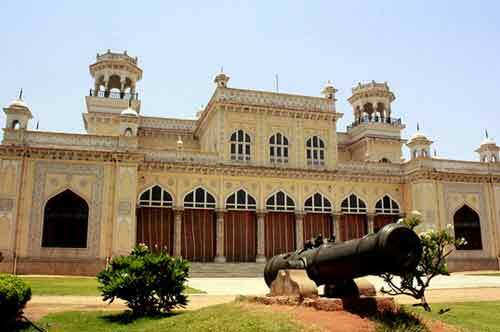 What I liked the most about Hyderabad Chowmahalla palace is its good condition. This palace is well maintained, even the ground is quite beautiful, its interiors with massive and grand chandeliers are just breathtaking. It has good collection of books and other items too. Overall this palace is worth visiting. Check out chowmahalla palace timings before going...about entry ticket you need not worry as it only 40 Rs! After visiting Chowmahalla palace I realized this palace is so underrated. Its beautiful. Amazing collection, captivating interiors and good maintenance. I loved the way all the items have been displayed. There is a huge personal collection of Nizam…like crockery, royal dresses, paintings and even vintage cars. 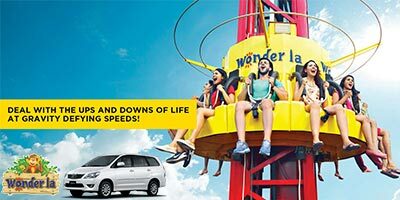 Plan your visit on a weekend it is open only till 5 in evening. Chowmahalla Palace timings are from 10 am to 5 pm. Its beautiful. This palace is not very popular but it is one place everyone should visit. 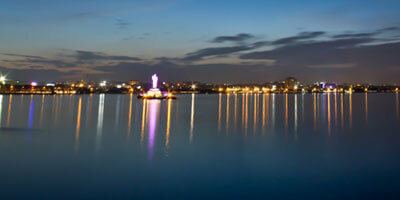 I have been in Hyderabad since long but visited only recently. It is as good as Salarjung museum, the collection is good and showcased in good manner, clothes, books, manuscripts, cutlery, cars and paintings. Everything is awesome. And the unbelievable fact is that chowmahalla palace ticket price very less while the experience is worth remembering!